Are you a homebrewer that wants to try something new? Well these Island Mist Wine Kits are a perfect everyday wine! 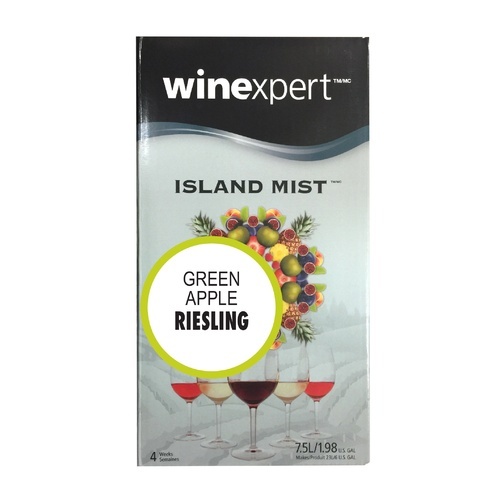 Island Mist is the perfect alternative to wine coolers and everyday wines! It combines the crisp freshness of varietal wines with full fruit flavor. The Green Apple Riesling from Wine Expert is a perfect everyday wine. With complete fruit flavors and the crisp freshness of varietal wines, Island Mist is a fun refreshing beverage anytime. Ready to bottle in just 4 weeks. Clean, cool, and crisp with zingy acidity and fresh green apple. I purchased this because of the price. The wife and I are fans of Riesling and Gewurtztraminer, so I thought I would give this a try. This is surprisingly good as a social or dessert wine, even when you ferment it to 'off-dry' or 'semi-sweet'. I will admit that I added a bit more sugar to bump the ABV to a little higher level than the kit instructs, but it turned out very well.